What is Coriander Oil ? Coriander Seed essential oil has a combination of sweet, spicy, and woody aroma with a hint of fruit. It's scent can add a sweet freshness to blends. It is extracted (steam distilled) from the seeds of the cilantro plant. Coriander has many beneficial properties. An example, in addition to being an antibacterial, it supports the digestive system, and its stimulant properties enable it to help against fatigue. Coriander blends well with many essential oils such as the ones with woody notes like sandalwood, and cypress or the citrus oils like orange, and grapefruit. It is also a good companion to the spice notes like ginger, nutmeg, and frankincense. Use it in a massage blend to combat fatigue or along with lavender, sprinkle a few drops on bed linens or mist to encourage an extra restful sleep. Coriander (seeds) and Cilantro (leaves) are names for different parts of the same plant,and are a naturally healing food in both forms. Botanical Information - Rituals & History : The Coriandrum sativum herb is believed to have been one of the earliest plantings in North America. We know the leaf of the plant as Cilantro, and both cilantro and coriander has many culinary uses. 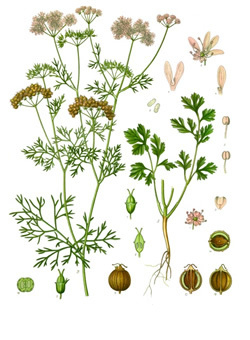 Coriander was found in the tomb of Tutankhamun, and was cultivated by the Egyptians. Coriander Constituents: Anethole, camphor, linalool, pinene, quercetin, rutin.